A baby shower usually focuses the guests’ attention on gifts for the baby to come. The Mother’s Blessing is about acknowledging the journey the woman takes carrying a child and honors her process and gift of sacrifice. Several ways of approaching this tradition in modern day are possible. The guests for a Mother-to-be shower can be women, men and children and include games (some that I have created), food and drink and toasts. 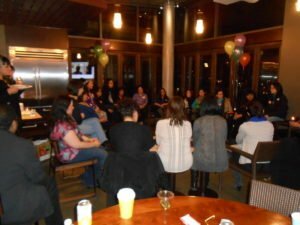 As the party winds down, many of the women may gather in a circle lead by the celebrant to honor the mother-to-be in a more intimate way. Or, a circle may be called to invite only women friends and family separate from a community Baby Shower. Because of our unique potential to give birth, sisters, aunts, mothers and grandmothers as wives have wisdom to share in a safe space during this sacred pre-birth time. There is also the possibility to design a custom, unique ceremony.